It is no secret that I do not love math. Therefore, it makes sense that I do not love teaching math to my children. That is why I was so excited to be able to get this review! 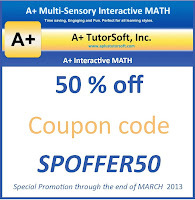 We had the privilege to review a math curriculum from A+TutorSoft, Inc. A+ TutorSoft offers lessons for grades 1st to 6th grade, as well as pre- algebra and algebra using either an online subscription or a full curriculum CD. 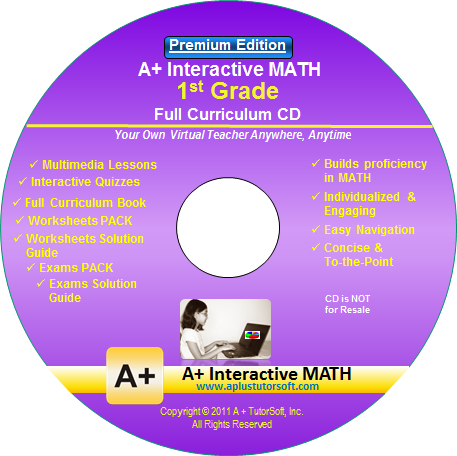 For our review, we used the A+ Interactive MATH CD for 1st grade. It is easy to install, and once loaded does not require you to put the disk in each time. Using step by step lessons, review practices, quizzes and tests, this curriculum covers a lot of ground in an orderly way. First grade concepts covered by chapters are Counting Numbers, Number Sense, Comparing and ordering, Addition, Subtraction, Fractions, Graphs, Time, Money, Measurements, Geometry and Algebra. Included are the lessons, quizzes and tests as well as their answers, additional worksheets, recommended lesson plans and a workbook. We used this curriculum for CJ's math five days a week. He had recently finished his Kindergarten curriculum, so I figured this would be a pretty seamless transition. Luckily, I was right! Like many five year olds, my son likes the computer so he was quite excited to get to do his math on the computer. Each day we selected the next lesson from the menu and learned a new concept. After each lesson he would have the opportunity to practice. One of the things we loved was though you can print off worksheets for each corresponding lesson, you can also choose to just do the review on the computer. If you answer a problem correctly, you get a hearty "well done". If you enter the incorrect answer you will get a step by step explanation of the problem. Because at this level there are only about 7-12 problems per review, the time spent doing the problems was quite manageable for a younger aged child. The tests at the end of each unit are a little more lengthy, but not too overwhelming. This is a pretty straight forward math program; no flashy games, graphics or rewards, though certificates are available to print out. That being said, A+ TutorSoft is colorful and engaging which we really enjoyed. I loved that even after completing the activities on the computer, we could print out the worksheets for further review if needed, as well as tests. The built in review is flooded with lots of positive reinforcement and an occasional animation that kept CJ engaged. The sidebar menu is well laid out and easy to navigate so we were able to jump around lessons a tad to explore new concepts. One of the new concepts we learned about was the greater than and less than sign. CJ had never been introduced to that and I was worried he might not be old enough to grasp the concept. A+ TutorSoft used the visual of an alligator, named Al E. Gator, who eats the biggest number and he got it right away. His comment after the lesson- "I am King of the numbers!" haha Because this curriculum uses auditory, visual and kinetic learning, it is able to appeal to a variety of kids' learning styles. We found out early on that when a question is asked by the teacher, she answers very quickly, often not giving the child adequate time to answer for themselves. For that reason, I stayed with CJ as he went through each lesson, stopping the CD after the questions so he would have time to answer. I found if I did not, my son soon got wise and just waited for the answer to be given to him. It would be nice if they would lengthen that pause a little. I also would have loved if once you answered each question it could be "entered" in by hitting the enter key on the keyboard, rather than having to use the mouse to click on the "next" button. This did slow our process down and frustrate CJ at times. I like this program. There were a few times I felt like the concepts were a little over the head of my son, but since he is technically just at the end of his Kindergarten year it may be that in a few months he would not struggle with some of those areas. It is a rather pricey curriculum, but let's face it, there are not many quality math programs out there that are cheap. You get what you pay for, and in this case, I do think you are getting a quality curriculum! The CD Software sells for $99.99. The premium edition sells for $124.99, and allows you to track up to 5 students manually. Online Homeschool edition sells for $19.95 per month, $49.99 per quarter, or $124.99 per year. The subscription covers one parent and one student. The online version automatically tacks the student's progress for you. 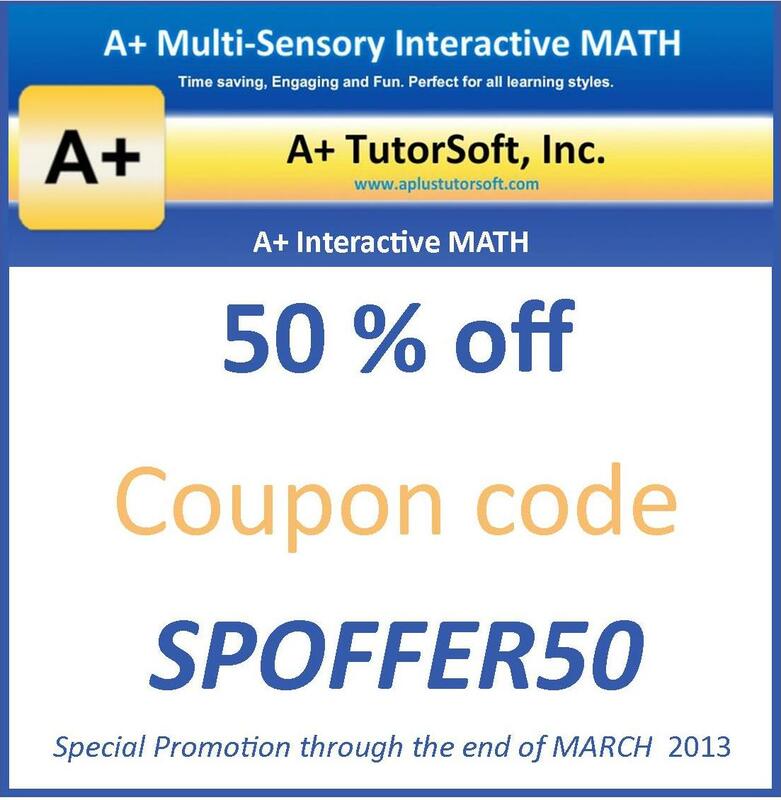 From now until the end of March A+ TutorSoft is offering a generous 50% off to my readers. Please use the coupon code below when ordering. Thanks for a wonderful review! I debated on reviewing this one, but decided against it. I was very interested in it, but we use Teaching Textbook which is similar to this although I think A+ has a few more features that TT does not. Wow, 50% off, that's a very generous offer! You are so welcome! It was a privilege to review!